Home » Baby » Baby Led Weaning » What is Baby Led Weaning? If you are about to embark on the weaning journey you probably heard about the different types of weaning techniques. You’ve almost certainly heard about BLW, but are probably wondering exactly what is baby led weaning? The ethos behind baby led weaning is that your forgo purees, and instead offer your baby a variety of foods which she can pick up and eat herself — allowing her to decide what, how much, and how quickly to eat. The idea is that they can explore a variety of foods, tastes and textures for themselves, at their own pace. At first, your baby may just play with the food, but this is all part of their development. They will soon progress to sucking, chewing and swallowing. Baby-led weaning also encourages baby to join the dinner table and experiment with meals the whole family are enjoying (albeit without added salt). These combined elements lead to the view that your baby will go on to develop healthy eating habits for life. 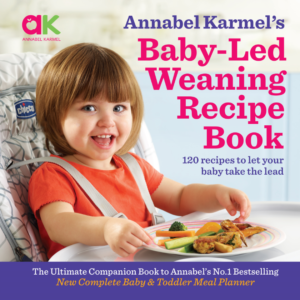 Some feel a need to go with spoon-feeding or baby-led weaning, but Annabel believes that you don’t have to choose. At around six months, you have the freedom to combine an element of baby-led weaning alongside spoon feeding if you feel that’s right for you and your baby. How do I know when my baby is ready for baby-led weaning? She shows that she wants to join in family mealtimes. Prior to six months, babies tend not to have developed the hand-to-eye coordination needed for baby-led weaning, so it’s not an option if your baby is ready to wean early. In this case, purees or well-mashed food are an obvious bridge between milk and solid foods. Is it ok to combine spoon feeding with the principles of baby-led weaning? Many babies take to self-feeding early and easily – these babies often reject spoon-feeding altogether so clearly it makes sense to let them do baby-led weaning. But other babies, particularly those whose motor skills are slower to develop, will not be able to self-feed useful amounts of food until they are much older than six months; however, once babies get to six months they need essential nutrients such as iron which cannot be fully gained from breast or formula milk alone. This is where some form of pureeing or mashing of nutrient-rich food such as chicken or meat becomes important. Quite simply, some babies don’t cope as well as others with lumpy food and need a more gradual transition from milk to solids. While lots of parents have success with spoon-feeding or baby-led weaning alone, combining the two is often an approach most suited to lots of families. What’s important is that there is no right or wrong to weaning. Some babies thrive on purees, others on finger foods and yet some on both. Instead of committing to a certain feeding method, it’s ok to be flexible in your approach and to follow your intuition and your baby’s developmental signs.